PezCycling News - What's Cool In Road Cycling : Vuelta’15 St. 21: Eventually Degenkolb Wins In Madrid! 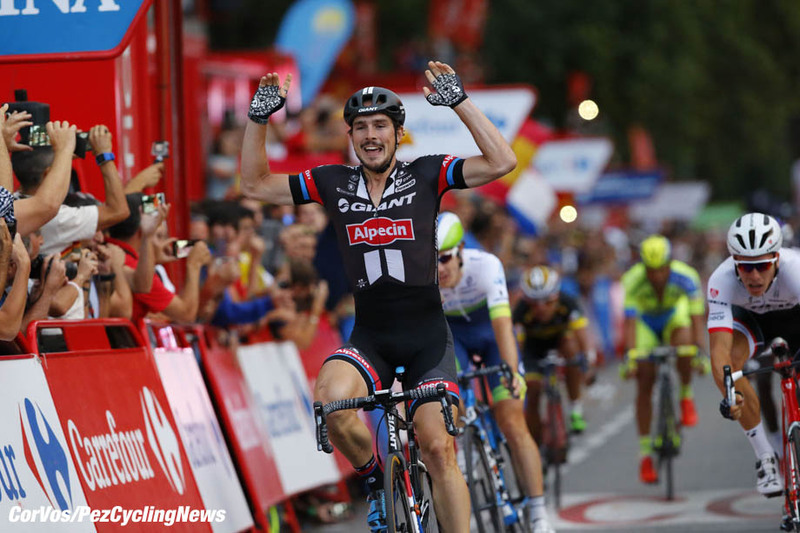 Vuelta’15 St. 21: Eventually Degenkolb Wins In Madrid! Race Report: The final stage of the Vuelta a España was always going to end in a bunch sprint and John Degenkolb wanted that win more than anything, for himself and for his Giant-Alpecin team. 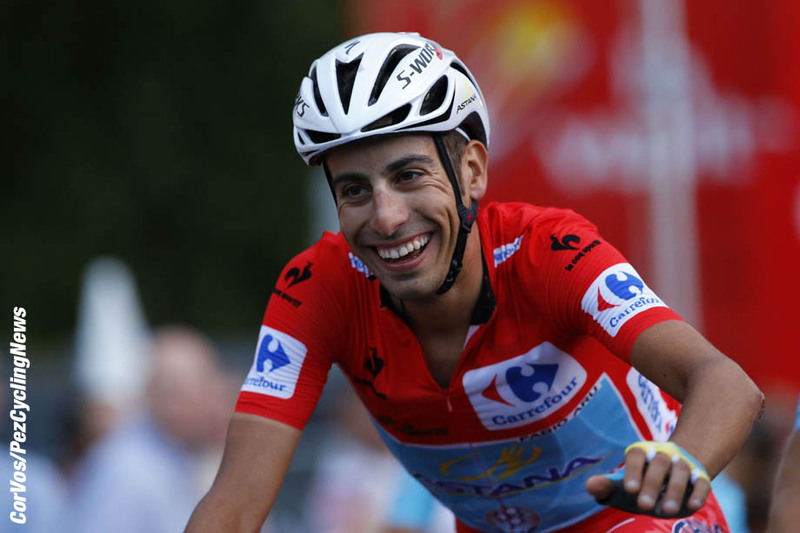 In the peloton Fabio Aru was ecstatic as he crossed the line for his Grand Tour win, the first of many. Shelley Olds took the Challenge Madrid in an exciting sprint. There were TV coverage problems for the last stage of the Vuelta in Madrid, but John Degenkolb had no problem putting his wheel across the last finish line of the Spanish grand Tour in Madrid. 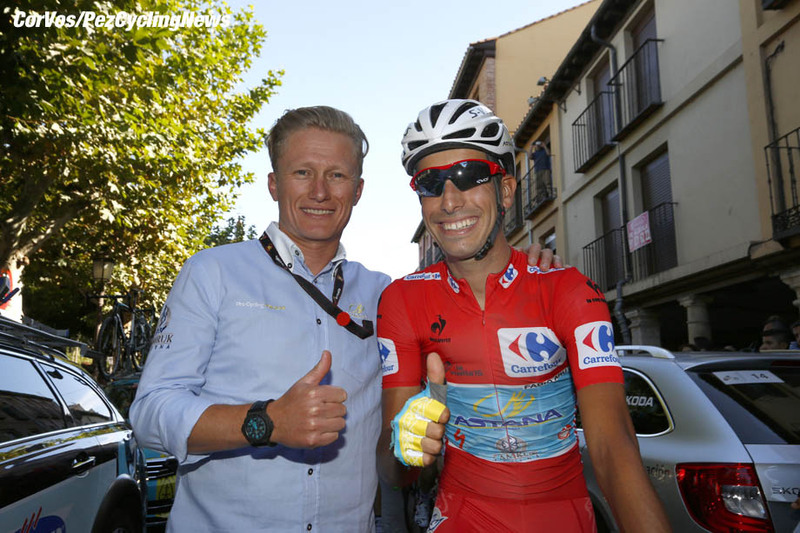 Fabio Aru was safe in the peloton and confirmed his promising future in one of the hardest three week stage races for years. But before all that; the ladies fought out the Madrid Challenge. 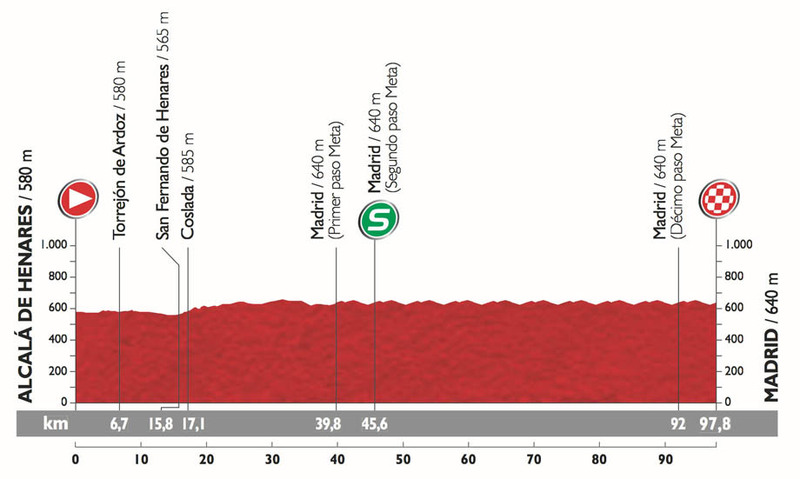 Stage 21 of the 2015 Vuelta a España started in the outskirts of town in Alcalá de Henares for a ‘ride’ of 97.8 kilometers, including ten laps of the finish circuit. Just like all other last stages of a Grand Tour it was an easy start, unlike other races there was an air exclusion zone over Madrid due to a security alert at Madrid airport, so not much TV coverage except for the start/finish area. Spanish station TVE showed a ‘humorous’ retro musical program that was slightly more interesting than the racing and after explanations they showed a modern western film. Thank goodness for Eurosport. The early kilometers were the usual photo opportunity for the jersey holders before they hit the circuit. 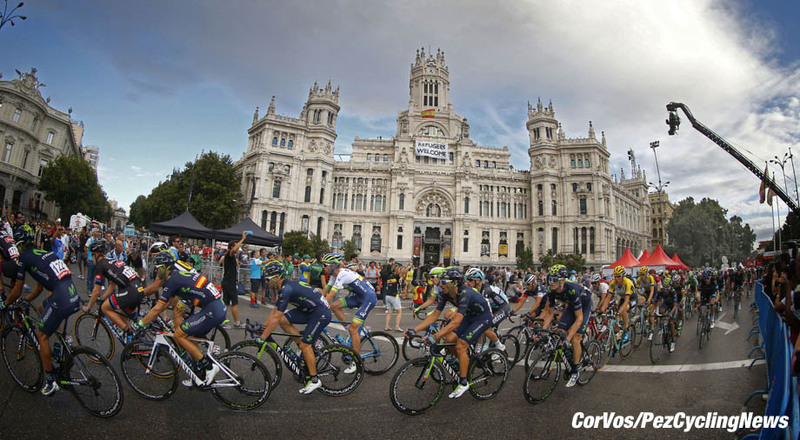 At the intermediate sprint Alejandro Valverde was led out by his Movistar team for points towards the Green jersey. Jersey holder Rodriguez was not to be seen and Valverde took 4 points and his two teammates took the remainder, so the man from Murcia now has the jersey. ‘Purito’ had a wheel change just before the sprint and has lost out again, you have to feel sorry for the little Catalan rider. A small break managed to slip off the front: Benjamin King (Cannondale-Garmin), Matteo Montaguti (AG2R-La Mondiale), KOM, Omar Fraile (Caja Rural-Seguros RGA), Laurent Pichon (FDJ.fr), Carlos Verona (Etixx - Quick-Step) and Giovanni Visconti (Movistar). They gained 30 seconds (40K to go) on the Trek and Giant-Alpecin controlled bunch who were working for Van Poppel and Degenkolb for the stage win. LottoNL-Jumbo and Lampre-Merida had also moved forward as they had missed the move. 35 kilometers out and the six escapees where being held at 25 seconds, five kilometers later and they had lost a further 5 seconds as Trek began to lift the pace. Next lap through and Lampre were at the head of the chase and the lead had dropped another 5 seconds. Colombian rider, Fabio Duarte tried and failed to cross to the leaders and the gap came down to 17 seconds. Through the finish again with 3 laps to go, and Ben King was dragging the others over the line with a stabilized lead of 17 seconds. BMC took up the reins for a bit of a turn on the front and it was only a matter of time before the six were caught. Another lap down and King was really putting the pressure on and split the lead group as they were within touching distance of the peloton. With less than 2 laps to go the race was all together and the sprinter teams were stretching the peloton into a thin line. Before the last lap, Iljo Keisse (Etixx – Quick-Step) went for a long solo and came over the line with a little gap as the bell rang. Katusha came to the front, but Alexis Gougeard (AG2R-La Mondiale) jumped past him as the helicopter pictures came back in time for the finish. Sky and MTN-Qhubeka came to the front, but it was Orica-GreenEDGE who dominated the final turns to the last straight with Mathew Hayman powering on the front. Giant-Alpecin smothered the Australian team on the finish straight to put Degenkolb on the front with 200 meters to go. Van Poppel kicked hard on his left but there wasn’t enough road left and the German took the win he had been trying to get for three weeks. Danny Van Poppel second and BMC’s Jean-Pierre Drucker in third. The Astana team riders encircled Fabio Aru for a big cheer as the Sardinian showed his big toothy grin. Astana team manager Alexander Vinokourov said that Aru has a big future ahead of him and it would be hard to say other wise. Thanks for traveling the roads of Spain with PEZ, we hope you enjoyed our coverage, remember you only have one week to wait for the World Championships to start with the team time trial next Sunday. 25. Romain Sicard (Fra) Europcar. 25. Mikel Landa Meana (Spa) Astana at 51:30.